The Barbell Back Squat is a very good exercise, but it’s not necessarily for everyone. Proper form and technique are important for any structural exercise (one in which you directly load the spine), and the barbell back squat requires knowledgeable coaching to ensure safe execution. For an effective, safe alternative to the barbell back squat, try the Goblet Squat. I like this exercise, especially for novices and youngsters, once we have mastered and move beyond body-weight squats. 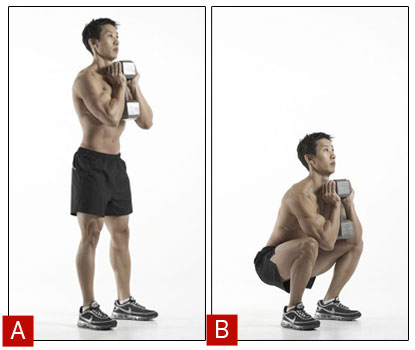 To perform the goblet squat exercise, hold a dumbbell (or kettlebell) “goblet-style” (pictured), vertically and at chest level, with the heels of both hands cupping the dumbbell’s upper head, as if it’s a large goblet. This provides counter-balance, helping you avoid the upper-body forward lean that can be a problem with the barbell back squat, enables better form and technique, and makes the exercise easier to perform. Start with at least a 25-pound dumbbell (although you can go even lighter), performing the exercise as you would any other squat-type exercise, and challenge yourself by increasing weight and/or repetitions as you are able.